Memory Machines, a performative tour through the concealed infrastructural sites and operations of Central Oodi was conducted by Samir Bhowmik in collaboration with performance group 00100 ENSEMBLE. 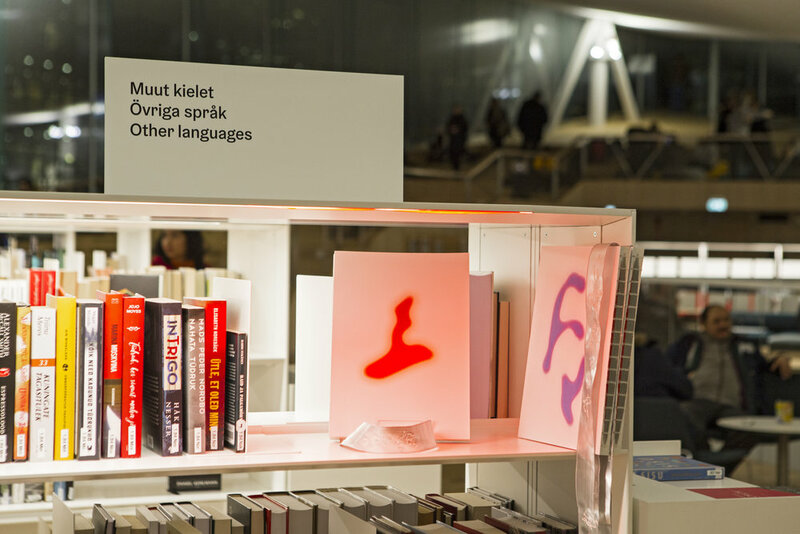 TThe Library’s Other Intelligences, an art project organized by the Finnish Cultural Institute in New York through its MOBIUS Fellowship Program in collaboration with the Helsinki Public Library, opened at the Central Library Oodi in Helsinki on January 11, 2019. The project is curated by MOBIUS fellows Shannon Mattern and Jussi Parikka. The exhibition is on view at Central Library Oodi until March 10, and the project will be presented in New York on March 9 as part of a symposium organized by the FCINY, The New School, and METRO – Metropolitan New York Library Council. The project invites visitors to the library to engage with the works ­– and with the new building – by attending live performances, embarking on expeditions, and reimagining how we will read, listen, and learn in a new techno-cultural future. Samir Bhowmik partnered with 00100 ENSEMBLE to present Memory Machines, a performative art project that explores the infrastructure of the Oodi Library. The work combines dance, theatre and circus with a guided tour that moves through the concealed infrastructural sites and operations of the building. This unique journey traverses places of climate control to power management, from checkout terminals to data centers, from automation to distribution and storage. All the sold-out Memory Machines tours were organized during the first week of the exhibition. As a visual performance, the work aims to interrogate the ecology of machines and the situated interactions between humans and technology. Jenna Sutela’s nimiia ïzinibimi video installation welcomes the visitors at the entrance hall of Central Library Oodi. Jenna Sutela’s nimiia ïzinibimi is a unique book based on an invented new language representing those who lack first-hand access to, or the ability to produce, “natural” language. It welcomes and embeds more-than-human voices into the Helsinki Central Library’s collection. 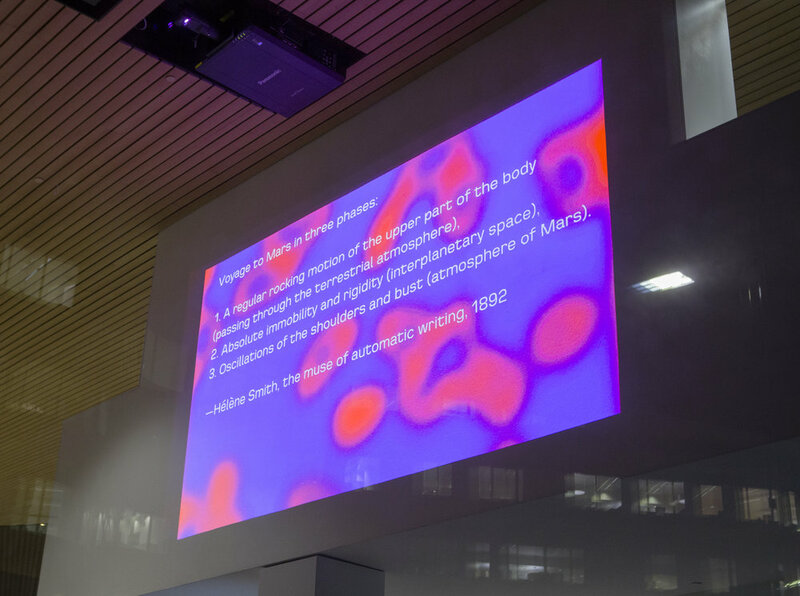 Sutela presents in the book the interactions between a neural network; Martian language from the 1800s, originally channeled by the French medium Hélène Smith; and movements of Bacilli subtilis, extremophilic bacteria that, according to recent spaceflight experimentation, can survive on Mars. A video in the entrance hall of the library depicts both the organic and the synthetic materials in which the book originates. Jenna Sutela’s unique artist book nimiia ïzinibimi can be found from the ‘Other languages’ section and will remain permanently in the library’s collection. Jenna Sutela created a new language for her nimiia ïzinibimi book. Tuomas A. Laitinen composed a performative installation and a sound piece with generative tools that are interpreting the construction of medieval musical canons. He experiments with the form of the canon, a kind of an algorithm that allows us to generate complex polyphony from seemingly simple collections of organised sound. Here, the canon form can be seen as a morphing and churning organism, a layered progression without a definitive beginning or end. Tuomas A. Laitinen will organize two more performances at central Library Oodi before the end of the exhibition. The performance dates will be announced on FCINY’s Facebook page soon. Tuomas A. Laitinen will be FCINY’s artist-in-residence in Sep-Oct 2019. Performers of Tuomas A. Laitinen Swarm Chorus used ultrasonic speakers to target desired sound effects on audience. Tuomas A. Laitinen’s Swarm Chorus performance at Central Library Oodi on January 11, 2019. Media scholars Jussi Parikka (University of Southampton, Winchester School of Art, UK) and Shannon Mattern (The New School, US) have been participating in the MOBIUS Fellowship Program since Fall 2017. As part of their fellowships, Parikka and Mattern traveled to Helsinki in December 2017 and May 2018 to do background research, to meet artists and colleagues, and to give context to the project in two public events organized in collaboration with PUBLICS. MOBIUS Fellowship Program is supported by the Kone Foundation. The collaboration between Parikka, Mattern and FCINY continues and the next public manifestation will take place in New York on March 9. The upcoming symposium Code, Craft & Catalogues: Arts in the Libraries will bring together visual artists and library professionals from United States and Finland to discuss the futures of libraries through interdisciplinary collaborations. The Library’s Other Intelligences will be one of the case studies featured in the one-day event. More info coming up soon.